So far we’ve talked about the 1890 Manifesto, as well as the 1904 Manifesto. A third manifesto was issued in 1933, and that actually led to the formation of several polygamist groups, such as the Apostolic United Brethren. Anne: When Joseph Musser was the senior member, because the other three before him had passed away, then that’s when the “split” happened. It’s too complicated to go into; suffice it to say that there were two members that they wanted to add to that quorum, and Joseph Musser was not in favor of that and he called Rulon Allred, Owen Allred and some others to another council, so there are now two councils. Anne: Yes, and each one claims that they’re the only ones that have the authority, or the true priesthood or whatever you want to call it. So that’s when the division began. Joseph Musser died in 1954, so this happened before that. They went to prison, and when he came out he was not feeling well and anyway, it’s a whole lot of story. In this next episode, we’ll talk about the Third Manifesto, as well as one specific group: the Apostolic United Brethren. You may be familiar with them if you’ve watched the tv show, Sister Wives, with Kody Brown and his four wives. Kody’s daughter Madison tried to join the LDS Church. GT: Ok, I know his daughter, I want to say Madison, I can’t remember, was going to Utah State I believe and she actually wanted to join the LDS Church. Anne: And they wouldn’t let her. GT: And they wouldn’t let her, and she said, “I don’t want to be a polygamist. I don’t want to do anything.” But they still wouldn’t let her. Essentially the church policy is that they want to—you have to basically disown your parents, or I don’t know if that’s the right terminology. Anne: I think that varies. Without mentioning a name, there is a family whose son—I don’t want to say anything that’s going to get anybody in trouble. Let’s just say that he joined the church, the LDS Church, had friends that were LDS, went on a mission for the Church. He didn’t have to deny his parents, but he had to deny his intent to live it. He now is back from his mission, performed an honorable mission. He was not prevented from joining the church, even though they knew what family he came from. So that’s what I say, it’s going to vary. Should Madison have been prevented from joining the LDS Church? 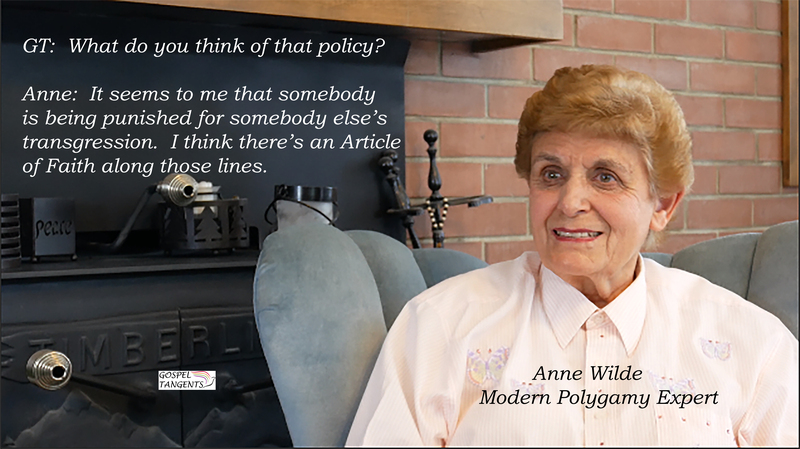 Check out our conversation with Anne Wilde…..
 John Y. Barlow was head of the quorum until his death in December 1949. Previous post: Did Woodruff Marry After the 1890 Manifesto? Next post: How Do Polygamists Feel About Gay Marriage?